Huhtamaki Lurgan, global specialists in packaging for food and drink, has presented two local Northern Irish charities with a cheque for more than £500 each, with a promise to continue raising funds for the causes throughout 2015. 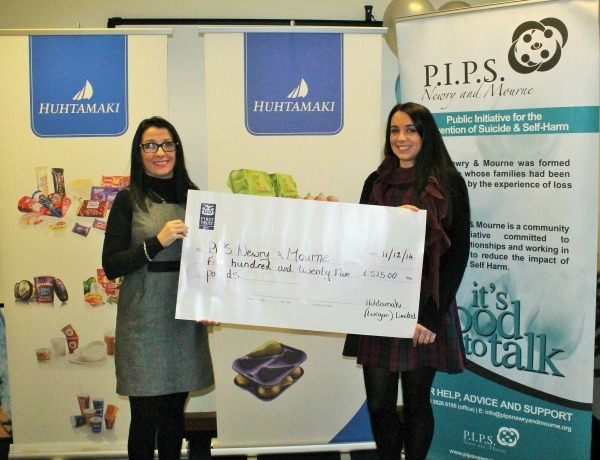 The Children’s Heartbeat Trust and Newry and Mourne Public Initiative for the Prevention of Suicide and Self Harm (P.I.P.S) received the majority vote from over 200 employees to be Huhtamaki’s joint Charity Partners of the Year. Over the course of the last twelve months, the Lurgan-based workforce engaged in various fundraising activities, organised by the firm’s designated Charity Committee, to raise more than £1000 for the charities. “Strong ethics and integrity lies at the heart of how Huhtamaki operates throughout the entire business. We are passionate about giving back to the local community and recognise how important it is to create a positive social impact by helping those who need it most. “The sole purpose of our Charity Committee is to raise vital funds and awareness for various charitable causes, which our workforce feel passionate about supporting and are eager to do so. “As a result, employees have donated their spare time to help organise a number of charitable initiatives such as bun sales and Christmas Jumper days which have been hugely successful and extremely worthwhile. The factory was also awarded €1000 for achieving over 500 days without any accidents, which we decided to share between the two charities in celebration of this fantastic accomplishment. “Since establishing our dedicated Charity Committee more and more employees are signing up to increase the level of support we can provide to organisations in need, and to maximise our fundraising potential, which is a real testament to our commitment to community engagement. Huhtamaki first supported the Children’s Heartbeat Trust last year when Anna Byers, daughter of a former employee, organised a fundraiser to help raise money for the Trust which provided invaluable aid to her daughter Natasha, who lives with a congenital heart defect. “Natasha’s grandfather worked at Huhtamaki for more than 15 years and the support from his ex-colleagues has been amazing and very touching. “We first made contact with them over a year ago and since then we have been delighted with their ongoing dedication and commitment and are very grateful to be named as a joint Charity Partner for the year ahead. "The money raised will go towards providing emotional, financial and practical support to the families of children living with congenital heart disease in Northern Ireland as well as aiding research into the causes and treatment." P.I.P.S Newry and Mourne will use the funds to help those affected by suicide in the Newry and Mourne area, through a comprehensive programme of crisis services, such as drop-in centres, bereavement support and counselling. “We cannot thank Huhtamaki enough for their kind support in helping to raise these vital funds, which will no doubt help to make a real difference to the lives of many throughout the South Down region. “It’s a sad truth that every year hundreds of people suffering from mental illness commit suicide in Northern Ireland, devastating friends, family and the wider community. “P.I.P.S Newry and Mourne works tirelessly to provide comfort and support to those who are experiencing such trauma through our Drop-In Centre which facilitates the listening, counselling, therapy and training of those who need it the most. Huhtamaki Ltd is a world leading manufacturer of quality, consumer-friendly packaging to a portfolio of globally renowned brands such as McDonald’s, Tesco, M&S and Noble Foods.